2 - 3.............Bingo von Ellendonk. 2 - 3.............Cona von Niederkassel. 3 - 4,4..........Jago von Beelen. 3 - 4,5..........Satan von Ellendonk. 1993: 89-78-93 = 260 points (18th). 1991: 92-80-98 = 270 points. 1991: 83-73-87 = 243 points. 1995: 100-90-92 = 282 points (4th). 1995: 94-97-95 = 286 points (7th). 01/12/1991: 99-88-93 = 280 points. 31/08/1991: 92-77-87 = 256 points. 10/09/1994: 100-96-93 = 289 points. 04/06/1994: 100-96-96 = 292 points. 28/03/1992: 97-90-87 = 274 points. 14/03/1992: 91-81-89 = 262 points. 18/05/1991: 96-92-91 = 279 points. 04/07/1992: 97-93-96 = 286 points. 31/03/1992: 80-70-85 = 235 points. 20/04/1991: 83-73-87 = 243 points. Overall Build: Medium-strong; thick soft fur; very good colour and markings; masculine profile, weak underjaw; short and firm back; good croup; very good front and good rear angulation; strong bone; free and balanced gaiting, back sufficiently firm in motion; good ligament firmness. Nature: Spirited, lively, uninhibited, open and sure. Very high protective instinct and fighting spirit, very high courage and high hardness with middle sharpness. Delos von der Domstadt competed in the D.V. Meisterschaft and passed the Körung 'for life' with highest ratings for courage and working drives. His sire, Amor von der Weyermühle, passed the ZTP with 1A rating for character and SG for conformation and lived to 12 years of age. His maternal grand-sire, Arco von der Weyermühle, competed in the in the D.V. Meisterschaft, was the Landesmeister of Landesgruppe Westfalen in 1984 and passed the Körung 'for life' with highest ratings for hardness and working drives. Nikira: IPO 3 and passed the ZTP with 1A rating for character and SG for conformation. She is dam of the vom Ferrenberg “A, B, C” litters (Balou, Cleo). Fee: IPO 1 and dam of the vom Strundertal “J, M, N” litters (Marylou). Hexe: IPO 1 and passed the ZTP with 1B rating for character and SG for conformation. She is dam of the von Valinor “A, B” litter. Kleo: IPO 2 and dam of the vom Burgwald “M, O” litters (Meike). 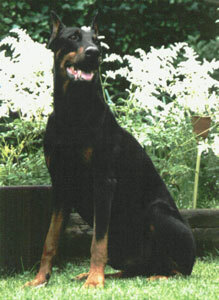 Caltha: SchH 3, FH and dam of the von der Sonnenleite “A, B” litters (Azzra).